My mantra is that people will escalate if they do not feel heard, and will deescalate if they do feel heard. If someone is getting louder, repeating themselves, or using increasingly destructive methods to get their point across, it’s because they don’t feel heard. 1. Loosen your grip on your own story – You must be willing to acknowledge that your own version of what happened, is happening, and will happen might not be the true story, the only story, or the whole story. Stay open to new or missing information, and information that counters what you already believe. 2. Accept the other person’s story as equally true as yours – Rather than trying to assert your version of the facts, or disprove the other person’s story, accept their story as the truth. If someone says, “you disrespected me,” and you believe you did not disrespect them, and it was certainly never your intent to do so, rather than disprove them or argue back, allow their reality to coexist with yours. Allow the possibility that you did disrespect them and then dig deeper into their story. What did you do that they perceived as disrespectful? What impact did their feeling disrespected have? What could have been done differently that would have made them feel more respected? Effective listening is a power tool in deescalating strong emotions, and fostering shared understanding. The next time you find yourself in conflict, follow the three-step process to hone your effective listening and de-escalation skills. Listening or active silence is like a “wonder drug” for communication. Staying silent but attentive to conversations, staying curious and asking questions to draw out others and clarify meaning, and sharing our own views as a reflection of what has been said, opens new possibilities. It helps people feel their contributions matter, conveys respect and respect builds trust and trust is the currency of our relationships. A typical study points out that many of us spend 70 to 80 percent of our waking hours in some form of communication. Of that time, we spend about 9 percent writing, 16 percent reading, 30 percent speaking, and 45 percent listening. Studies also confirm that most of us are poor and inefficient listeners. 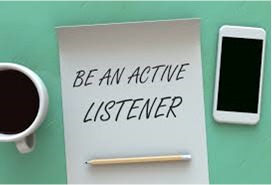 Listening is a skill that if practiced and honed will lead to better relationships. In this quiet month of August, it’s a good time to reconsider the art and practice of listening. Let’s kick it off with a proposal to update the phrase “Active Listening” to “Deep Listening” or listening to understand. This differs from the transactional way we too often listen when, rather than hearing what a person actually means to say, we add our own meaning to what we think they mean to say. Remember the exercise often used in communication skills training when one person speaks for 2 minutes and the other listens without speaking. They’re then asked to report on their experience as the person listened to or the person listening. The first time I did this exercise, I was amazed at the direction the speaker took. I was sure I would have altered that direction had I commented or asked questions. I learned something I would not have learned had I interjected during that few minutes and they reported feeling listened to. As a coach, we learn to both stay curious about what we’re hearing but not formulate questions or direction as our client is speaking. What’s cool about this is that we not only learn from the person speaking but they are learning too and revealing directions we can then help them see and follow. 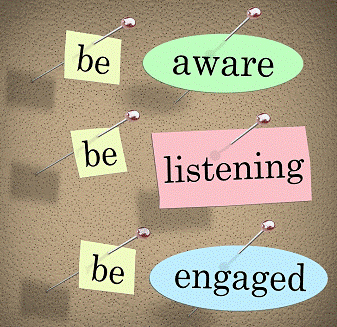 “Active Listening” is so important that this is the reason I propose a rephrase. The phrase has become so overused that often people who must communicate well for their jobs know what they are supposed to do and many believe they already do it. 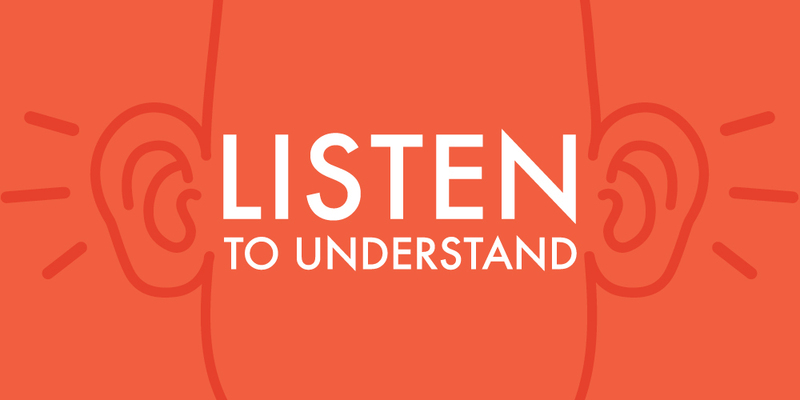 If we talk about listening differently, it can help people reconsider what it means to listen to understand and help those who need to be understood feel listened to.